I have added this revision as an update to this post. The comment by “K Alton” is correct. The first photo is of a man called Geng Libo. The second is Ou Gulfeng. Neither are Huang Chuncai. But, though the comment left by “racliu”, I’ve been able to uncover more information, and photos, about Huang Chuncai. Visit the updated post. Apparently most sites on the Internet are content with reporting and showing Huang Chuncai’s horrific photos, but stop short of showing his progress. Ever since I discovered this story in Fortean Magazine, I hunted the Internet for my original post, April 20. (Read the original post for Huang Chuncai’s full story.) 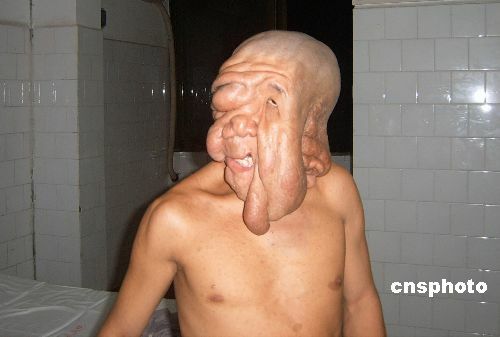 By that time, Mr. Chuncai had already undergone the second surgery (January 7, 2008 ) to remove the tumors that have grown around his face. Even at that time, I could find no reports of photos of his recovery. You would think people would be interested to see this man’s life improve. Apparently not. After much scouring, I found two photos showing his recovery. Both were on site were I couldn’t even hazard a guess to the language. Maybe Scandinavian. Maybe Polish. Since I used Google’s image search, I couldn’t translate the page to see how Mr. Chuncai had recovered. 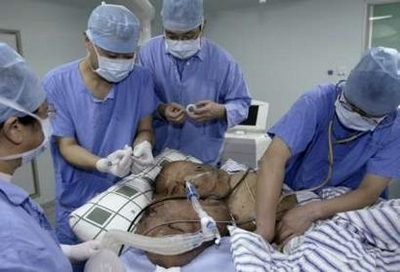 Here you see Huang Chuncai on the operating table before his second, January 7, operation. 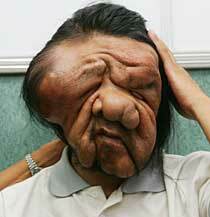 The operation took place in Guangzhou, and removed almost 10 lbs from his face. These two photos show how Huang Chuncai has recovered. The first I can only guess if this is Huang Chuncai. I think it is. The second was pulled from a site that had older pictures of the man, so I’m confident this is him.